Snowmobilers in the state are anxiously awaiting the formation of the Mackinac Ice Bridge, a naturally forming ice path between mainland Michigan and Mackinac Island. Solid enough to drive a snowmobile across, it offers an exciting – and unique – way to visit one of our state’s most interesting destinations. But how do riders know that the path is safe? More importantly, how are they guided along the admittedly treacherous route? Every year, Mackinac residents stockpile their used Christmas trees and drop them off at British Landing for this exact purpose. Used to line the way from St. Ignace to Mackinac, these old Christmas trees are gifted with a renewed purpose: helping snowmobilers find their way safely across the ice bridge. Placed at regular intervals, the trees are used much like highway mile markers: allowing travelers to gauge their progress and, more importantly, stick safely to the narrow, icy path. 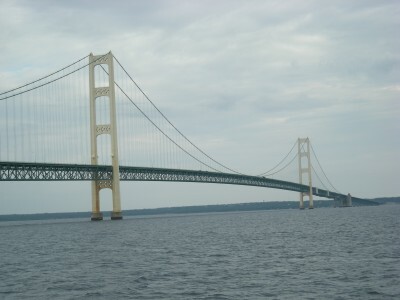 In fact, the bridge is so narrow – and dependent upon unpredictable weather patterns and temperatures – that the Coast Guard specifically cautions that it is “extremely dangerous.” Naturally, this warning only serves to promote the bridge, encouraging more and more daredevils to experience it every year. As a result, residents of St. Ignace find themselves tending to the discarded Christmas trees, “planting” new trees as old trees fall and constantly inspecting the integrity of the ice. At Premium Christmas Wreaths, we’re always happy to hear of novel uses for the season’s retired Christmas trees. During the Christmas season, they bring joy to the homes of countless celebrants and, after the holidays, we’re ecstatic that they have found a noble and productive purpose. We feel that keeping snowmobilers and winter enthusiasts safe as they experience what our state has to offer is a fitting way to honor the life of your Christmas tree. So, to the residents of St. Ignace and Mackinac from the proprietors here at Premium Christmas Trees: thanks for keeping our fellow Michiganders safe and we’ll see you next year!